Pattern: It is the replica of the final product with certain modification (allowance, provision of core print, etc.). The cavity of the mold is created with the help of a pattern. Patterns are slightly larger than the casting. They are made of wood, metal, plastic, etc. Molding sand: The refractory material that creates the mold cavity. It is a mixture of silica, clay, and moisture in appropriate proportion. It surrounds the pattern while making mold cavity. Backing sand: It is the outermost layer of sands. It constitutes more volume in a mold. They are normally burnt sand. Facing sand: Innermost and least volume layer of sand. They applied to the inner surface of the mold cavity to ensure the better surface finish of cast. Parting line: This divides the two molding flask, the same line divides the two halves of the pattern in the split pattern. Core and chaplet: Cores are used for making hollow cavities in casting. The chaplet is used to support cores inside the mold cavity. Chill: These are the metallic object placed inside the mold cavity to ensure uniform (or desired) cooling rate of molten metal. They act as a heat sink and enable rapid localized cooling. 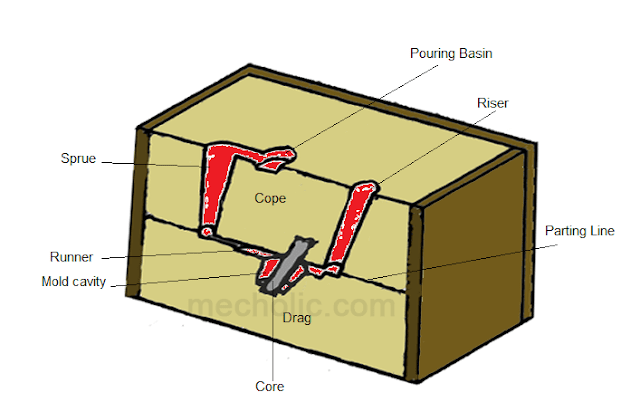 Pouring basin: It is a funnel-shaped structure at the top of the mold. Molten metal is poured into pouring basin. Sprue: Molten metal flow from pouring basin to the mold cavity through a passage known as sprue. It controls the flow of molten metal. Runner: These are the passageways in parting line that regulate the molten metal to the cavity. Gate: The actual entry point of molten metal to the mold cavity.